PPSS Body Armour are globally respected experts and manufacturer of stab vests and innovative knife protection. They have commissioned Deadline Digitalon a number of occasions to produce a product demonstration videos using chroma key. 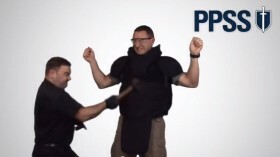 These videos were commissioned by workplace and personal safety specialists PPSS Body Armour to provide the ultimate demonstrations of their latest products, which include slash resistant fabric Cut-Tex PRO, the world’s toughest blade resistant clothing, stab resistant body armour and anti-spit masks. The company’s CEO Robert Kaiser put the garment to the ultimate test to show how effective it is at protecting the wearer from any type of sharp object. It employs the use of Deadline Digital’s portable chroma key studio. The technique puts the person or object you’re filming in a virtual setting – in this case in front of a backdrop featuring the company’s logo with an effect timed to bring it to life. It means you don’t have to be seen to be in the same old office when you’re on video – even if that’s where you were filmed. Click here to see the video on the PPSS website.